Including today, there are 45 days left in 2016. I don’t know about you, but that scares me. I haven’t accomplished my 2016 goals yet. I am lagging behind in almost everything even though I feel like I’ve worked harder on meeting my targets this year than any other. Sometimes, it just feels like time is moving too fast to actually get anything done. Like we’re standing in a crosswind and whenever we try to take a step forward, we veer to the left or right so we’re always losing momentum on the hypotenuse. Sorry for the math references – I was tutoring trigonometry a couple days ago. Today, I’m trying to make peace with the things I cannot change. Time is going to pass whether I’m happy or sad so I’m keeping my spirits high. Last week, I decided to amp up my activity. I’ve been running more but I’m also walking more. This morning, I went for an early morning walk – not quite early enough to see the sun peek over the eastern horizon but it was pretty low when I first saw it. I took a different route than I usually go and saw this mural that reminded me of summer, which feels like it ended yesterday. But I don’t want to start with the time references again. I walked by Mt Morris Park where I’ve attended many a summer concert. I walked all the way to the FDR drive and watched the sun over the East River. Beautiful way to start a morning. I don’t know what your morning rituals are like but spending some quiet time outdoors really energizes me. Today was my 5th consecutive morning getting out for an early morning walk and I’m already seeing an increase in my productivity and a boost to my mood during the rest of the day. I started off this post by talking about the number of days left in the year and the crunch you might be feeling to accomplish the goals you’ve already set. And yet, here it seems I am encouraging you to take time away from chasing your goals to chasing sunrises instead. Sometimes, we have to reevaluate what will mean the most to us. Sometimes, we don’t have to choose because being more intentional in the short term helps to make the long terms plans more accessible. However you choose to spend the next 45 days, I hope you enjoy it and on New Years Eve, may we all be able to say it was our best year yet. Find me on Amazon, YouTube, Bloglovin, Instagram, Pinterest and Twitter. I know. I think this year is just going faster than any other. What, you’re working on your 2017 goals already? Nice! I don’t even want to think about how many few days there are left, LOL But on a plus side it also means I am that much closer to finishing this semester and that is definitely a good thing! 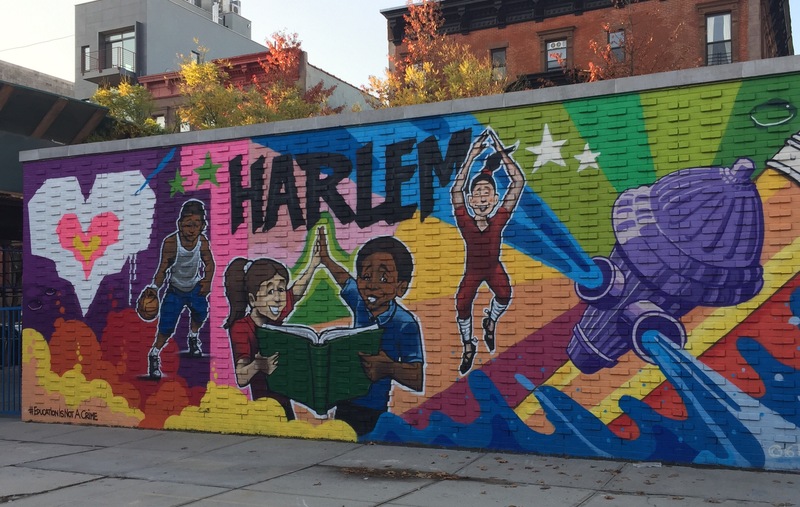 Love the Harlem mural, New York is probably one of the best places to go walking around and explore, I bet there are some really cool hidden treasure’s like this that are fun finds! Ack! Not enough time! But a good reminder, so that I can get on those 2016 goals! You know it. My mom was just talking to me about there not being enough time in the days to get all the things done. We’re all having the same problems. I like this countdown much better than the one at Walmart. Every day, every minute counts! Thanks for the little push this morning!